A busy day saw team Spen finish third in the league table after numerous personal bests. The day started with an early win for Molly Firth in the under 13 girl’s hurdles while also achieving a grade 4 AAA time, continuing the form with a personal best in the high jump and topped off with a win in the 800 metres. Personal best continued with Estelle Williams in the 150 metres who claimed third place and a second pb in the long jump. Megan Beal kept the personal best flowing with one in the 75 metres with a third place as well as a first attempt at the long to finish second in the B string. Following Megan in the 75 metres Lauren Dalton also ran a personal best to claim third in the B string as well as adding to the pb tally with a personal best in the shot putt throwing herself to a second place finish in the B string. Also in the shot Lily Croughan finished second in the A string with yet another personal best followed up with a personal best and third place finish in the 150 metres as well as a B string win in the javelin. Sophia Foulger wasn’t to miss out on the pb fever by running her way to a second place finish and personal best time in the 1,200 metres as well as just missing out on a personal best in the javelin. The girls relay team of Croughan, Beal, Williams and Firth ran a seasons best to finish second. 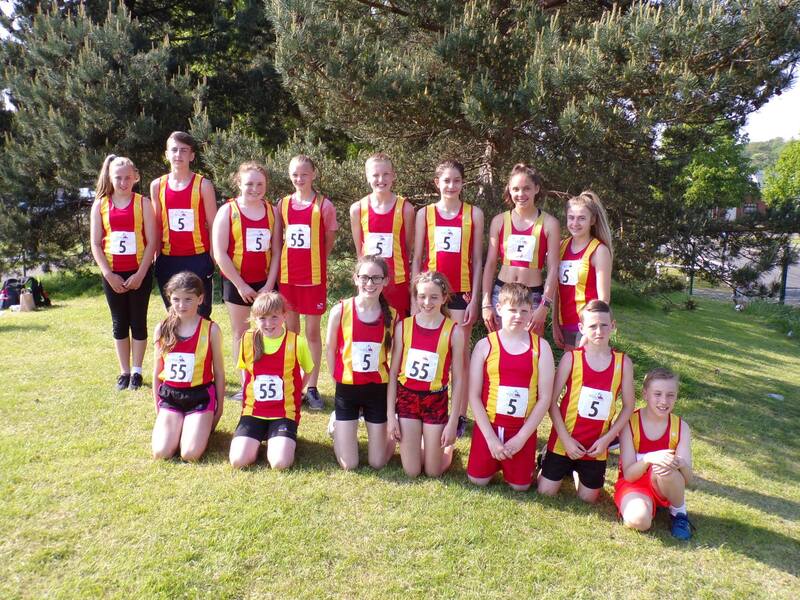 Every one of our under 13 girls gained a pb so really well done to all of them. In the under 13 boys, Lucas Barnes sprinted his way to a second place and a personal best, with a first place in the B string 800 metres and third places in the javelin. Matthew Dalton had his first run at the 800 metres which lead to a close second place finish just behind first place to be topped off with a personal best and third place finish in the long jump. Reuben Byfield competed for the club for the first time with an impressive run in the 200 metres to second as well as a second place in the B string long jump. Also in 200 metres Jack Barrowclough had a good first run at the distance, followed by a strong run in the 800 metres none scoring and to finally end on a big personal best in the shot putt. To the under 15 girls, Natalie Groves sprinted to a second place in the 200 metres just missing out on a personal best, followed up by a win in the 300 metres as well as scoring points for the team in the javelin. In the 100 metres Tilly Bowen finished third place, backed up with a third place in the B string 300 metres just missing out on a pb as well as bravely stepping up to try the hammer for the first time to score points for the team. Lucy Mae Curtin just missed out on a season’s best in the 200 metres to finish fourth while going onto jump a seasons best in the long jump. Thankfully the under 13’s didn’t steal all the pb’s as Ellie Holden ran a personal best and a third place finish in the 800 metres, with another third place finish in the long jump, as well as soldiering onto run in the relay after picking up an injury where the girls successfully got the baton round in second place. In the under 15 boys, Bayleigh Lawton sprinted to second in the 100 metres, with Lewis Barnes winning the B string, both boys ran the exact same time and both achieving a grade 4 AAA standard. An equal pb for Lewis gained him a second place in the 200 metres, joined by Bayleigh who won the B string with a personal best. York and Scunthorpe will move up divisions. Thank you to everyone for the help to run the events at both the home and away matches throughout the season. Also thank you to all the athletes who have competed for the team throughout the season.